Book the best wedding DJs today! The wedding reception season is upon us in Chicagoland and Northwest Indiana. And Chicagoland DJ Services is your recommended choice for a quality wedding DJ. We have many Saturday dates still available, but call today, as these dates will go fast. Now is the perfect time to lock in your entertainment with the best DJ’s in the business, and have one less thing to worry about for your special day. 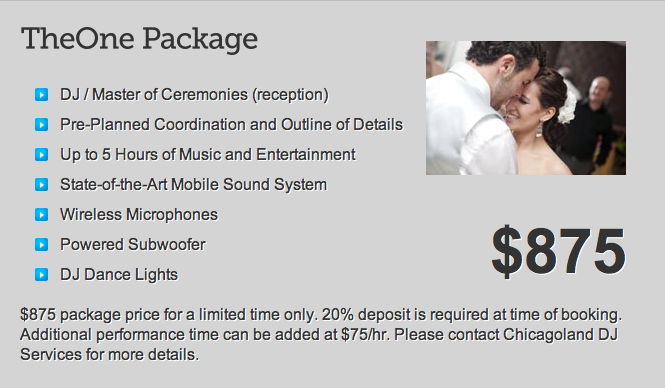 Chicagoland DJ Services offers a one price wedding DJ package to make your special day simple and spectacular! Your wedding DJ will serve as the Master of Ceremonies, keeping these event moving right along… such as the Bridal Party and Bride and Groom’s Grand Entrance, Toasts and Speeches, Special Announcements, Cake Cutting, First Dance Bouquet and Garter Ceremonies. And don’t forget about our complimentary wedding reception DJ planner, which makes customizing your wedding reception easy! We provide top notch entertainment from the opening dinner music all the way to the final dance of the evening. Your Wedding Disk Jockey will play a wide variety of popular music ranging from the oldies up to the latest Top 40, Pop, Hip Hop, Country, and rock & roll plus any special requests you may have. We have an unlimited music library and will work with you for all your special music requests. We make sure your dance floor will come alive with multi-colored beams of light that dance to the beat of the music. DJ Dance lighting is included at no charge. Plus, intelligent lighting with spotlighting capabilities, allowing us to spotlight your grand entrance, and accent your cake table and cake cutting ceremony. Our State-of-the-Art Mobile Sound System will deliver the quality sound and excitement your event requires, and our wireless microphones will allow your toasts and speeches to be given from anywhere in the room. We work with you. It’s your wedding. Your Wedding DJ is there to find out what you want and make it happen to the best of our abilities. 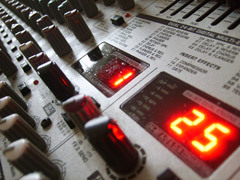 Your DJ for wedding will meet with you ahead of time to ensure all requests and expectations are meet and exceeded. Our complete coordination of the details of your special event ensure every last detail is exactly the way you want it and that your event flows smoothly from the moment you arrive to the last dance. Ask about our Custom Monogram Service available with any DJ package, now only $75. Have your initials or names displayed in lights!